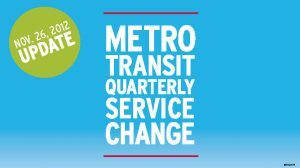 The quarterly Metro service change goes into effect on Monday, November 26, with changes to 22 MetroBus routes in Missouri, three in Illinois, and with adjustments to the MetroLink schedule to provide better connections between the Blue and Red Lines during weekday off peak hours and weekends. 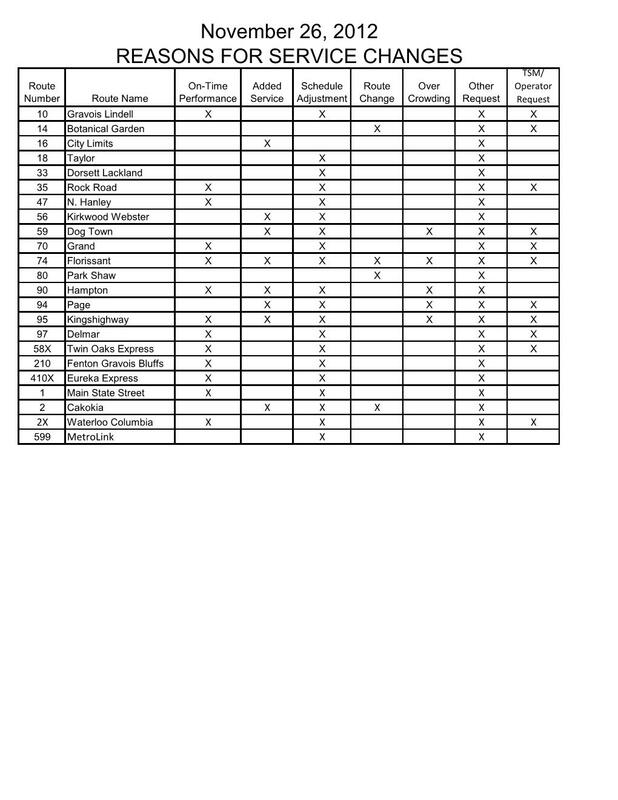 Some of the changes are minor route or schedule modifications aimed at improving connections and on time performance. Changes being made to our busiest MetroBus route, the #70 Grand, are based in feedback from customers and operators. 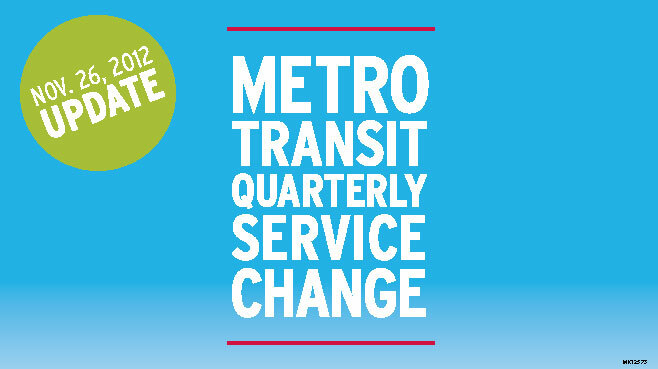 Please take a moment to review the upcoming service changes. Service will be added to the #16 City Limits, #56 Kirkwood Webster, #59 Dogtown, #74 Florissant, #90 Hampton, #94 Page, #95 Kingshighway, and #2 Cahokia. #10 Gravois Lindell: Added one southbound trip leaving Central West End Transit Center at 2:36 p.m. Adjusted all running times, including adding 7 minutes to the southbound trips from 2:20 p.m. to 5:12 p.m. Schedules. #14 Botanical Garden: Route reinstated to serve Central West End Transit Center, Botanical Garden and the Hill neighborhood. Service will provide 40 minutes rush hour and one hour off-peak 7 days a week. The #80 Park Shaw will no longer serve these areas. Schedules, Map. #16 City Limits: Weekday running time adjustments made for better schedule adherence. Added 2 late night trips at 12:25 a.m. and 1:11 a.m. to connect with the #61 Chambers. Time points at Jennings Station Road at Halls Ferry Road and Skinker Road at Forest Park Parkway removed to facilitate better schedule adherence. Schedules, Map. #17 Oakville: The trip leaving at 6:08 p.m. will now leave at 6:15 p.m. to better connect with MetroLink. Schedules. #18 Taylor: Last weekday trip shifted 3 minutes later to better connect with MetroLink. Schedules. #33 Dorsett Lackland: Saturday 6:18 p.m. trip leaving Rock Rd adjusted to 6:23 p.m., to better connect with MetroLink. Schedules. #35 Rock Rd: Weekday running time adjustments were made for better schedule adherence and the first trip leaving Rock Rd was adjusted to connect with MetroLink. Schedules. #47 North Hanley: The PM trip serving Lighthouse for the Blind adjusted from 3:55 p.m. to 3:51 p.m. (4 minutes earlier). Schedules. #56 Kirkwood Webster: Weekday trips added between Shrewsbury MetroLink Station to Rock Hill Loop, 7:26 a.m., 8:07 a.m., 9:53 p.m. and 10:35 p.m. Weekday trips added between Rock Hill Loop and Shrewsbury MetroLink Station, 7:40 a.m., 9:42 p.m. and 10:04 p.m. Schedules. #59 Dogtown: Due to overcrowding, one 8:20 a.m. trip added from Central West End Station to Forest Park Community College. Schedules. #70 Grand: Rescheduled based on feedback received from customers and operators, with weekday service enhanced from 12 to 10 min frequency for northbound trips leaving Loughborough Commons from 6:01 a.m. to 7:34 a.m. and 12:32 p.m. to 2:32 p.m.; and southbound trips leaving Broadway & Taylor Transit Center from 1:38 p.m. to 3:36 p.m. On Saturdays, running time adjustments made for better schedule adherence. Schedules, Map. #74 Florissant: Weekday service enhanced from 30 to 24 min frequency on southbound trips from 5:08 a.m. to 7:55 a.m. and 1:50 p.m. to 3:36 p.m.; and on northbound trips from 5:10 a.m. to 8:20 a.m.; 2:20 p.m. to 3:56 p.m. to manage passenger loads. On Saturdays, running time adjustments for better schedule adherence. Schedules, Map. #80 Park Shaw: Old routing reinstated. This route will no longer serve the Botanical Garden and the Hill area, which will be served by the #14 Botanical Garden. Schedules, Map. #90 Hampton: Trip added at 7:53 a.m. from Riverview Transit Center to Forest Park DeBaliviere MetroLink Station, to manage passenger loads. Running time adjustments for better schedule adherence. Schedules. #91 Olive : Weekday trip leaving Chesterfield Mall at 9:10 p.m. will now leave at 9:15 p.m. Schedules. #94 Page: The westbound 5:57 a.m. from the Wellston Station will start at Page and Grand Blvd. at 5:36 a.m. to manage passenger loads. Schedules. #95 Kingshighway: Weekday service enhanced from 20 to 15 minute frequency on northbound trips leaving Hampton Gravois Transit Center from 2:21 p.m. to 3:21 p.m., to manage passenger loads. Running time adjustments on weekdays, Saturdays and Sundays for better schedule adherence. Schedules. #97 Delmar: Running time adjustments on weekdays and Saturdays for better schedule adherence. Schedules. #58X Twin Oaks Express: Running time adjustments for better schedule adherence. Schedules. #210 Fenton Gravois Bluffs: Running time adjustments for better schedule adherence. Schedules. #410X Eureka Express: Running time adjustments for better schedule adherence. Schedules. #1 Main St State St: Rescheduled with additional trips during a.m. and p.m. rush hours. Schedules. #2 Cahokia: Routing to Range, Mildred and Cooper via Hwy 157 instead of via Falling Springs and running time adjustments. Schedules, Map. 2X Waterloo Columbia: Running time adjustments. Schedules. Our Planning Department put together the list of reasons for the service changes so you have a better idea as to why they are being implemented. What changes were made that allowed MetroLink to restore sensible off-peak transfer times at Forest Park? New phase of construction that doesn’t interfere with the schedule?